There are essentially three ways of transmitting video streams over the network from the source to the destination: broadcast, unicast and multicast. Broadcast is defined as a one-to-all communication between the source and the destinations. In IP video surveillance, the source refers usually to the IP camera and the destination refers to the monitoring station or the recording server. In this case, broadcasting would mean that the IP camera would send the video stream to all monitoring stations and recording servers, but also to any IP devices on the network, even though only a few specific destination sources had actually requested the stream. Typically, this method of transmission is not commonly used in IP video surveillance applications, but can be seen more often in the TV broadcasting industry where TV signals are switched at the destination level. Unicast is defined as a one-to-one communication between the source and the destination. Unicast transmissions are usually done in TCP or UDP and require a direct connection between the source and the destination. In this scenario, the IP camera (source) needs to have the capabilities to accept many concurrent connections when many destinations want to view or record that same video at the same time. In terms of video streaming in unicast transmission, the IP camera will stream as many copies of the video feed requested by the destinations. In figure 1 below, three copies of the same video stream are sent over the network; one copy for each of the three destinations requesting the stream. If each video stream is 4 Mbps, this transmission will produce 12 Mbps (3x4Mbps) of data on multiple network segments. As a result, many destinations connected in unicast to a video source can result in high network traffic. In other words, if we imagine a large system with 200 destinations requesting the same video stream, we would end up having 800 Mbps (200x4Mbps) of data travelling over the network, which is realistically unmanageable. Although this method of transmission is widely used over the Internet where most routers are not multicast-enabled, within a corporate LAN, unicast transmission is not necessarily the best practice as it can quickly increase the bandwidth needed for viewing and recording camera streams. In multicast transmission, there is no direct connection between the source and the destinations. The connection to the video stream of the IP camera is done by joining a multicast group, which in simple terms means actually connecting to the multicast IP address of the video stream. So the IP camera only sends a single copy of the video stream to its designated IP address and the destination simply connects to the stream available over the network with no additional overhead on the source. In other words, the destinations share the same video stream. In figure 2 below, the same three destinations requesting the video stream have the same impact on the network as a single destination requesting the stream in unicast and there is no more than 4 Mbps of data travelling on each segment of the network. Even with 200 destinations requesting that video stream, the same amount of data would be travelling on the network. 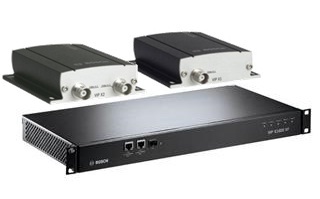 It is evident at this point that using multicast transmissions in an IP video surveillance application can save a lot of bandwidth, especially in large scale deployments where the number of destinations can grow very quickly. To find out more contact Controlware.